Jaksta can download from supported sites streaming via HTTP at up to 10x normal speed making it the fastest Stream Media Recorder available. Jaksta supports the largest number of streaming protocols available in a downloader today. There is no need to even continue to play the stream in your browser. Jaksta creates its own connection where possible and leaves you to continue browsing. 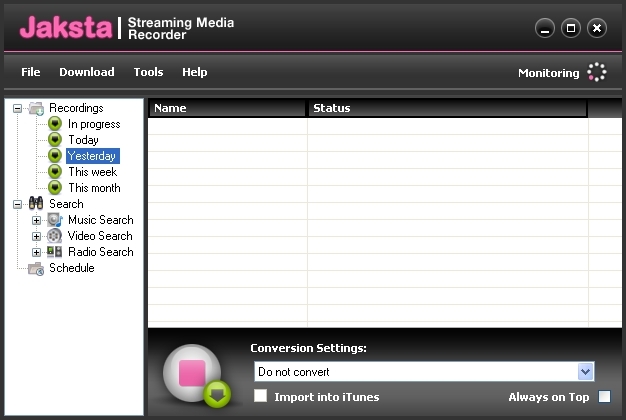 Downloading and converting couldnt be simpler! Supports the largest number of streaming protocols available in a downloader. ...... This ensures you comply with any copy protection mechanisms a site has employed. The fastest HTTP Streaming Media Recorder! Select the format you wish to convert your videos and music into from the drop downlist and immediately after a stream is downloaded it will be converted for you! Qweas is providing links to Jaksta 4.1.6 as a courtesy, and makes no representations regarding Jaksta or any other applications or any information related thereto. Any questions, complaints or claims regarding this application Jaksta 4.1.6 must be directed to the appropriate software vendor. You may click the publisher link of Jaksta on the top of this page to get more details about the vendor.